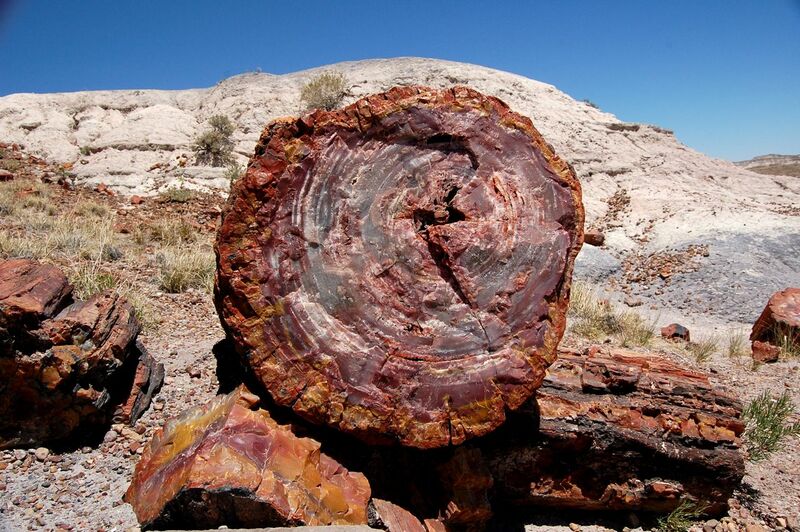 A petrified forest is a forest in which tree trunks have fossilized as petrified wood. 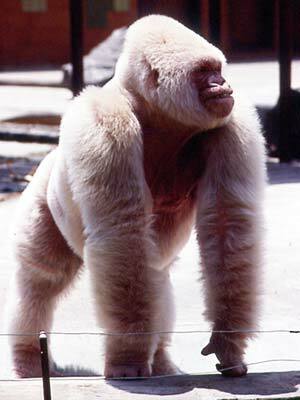 Snowflake (Catalan: Floquet de Neu) (c. 1964 – November 24, 2003) was an albino gorilla. 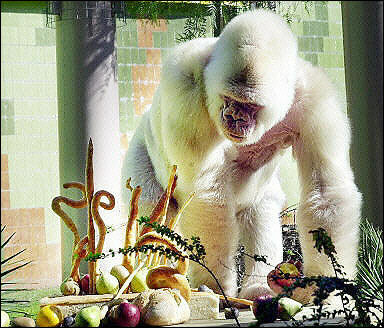 He was the only known albino gorilla so far, and the most popular resident of the Barcelona Zoo in Catalonia. 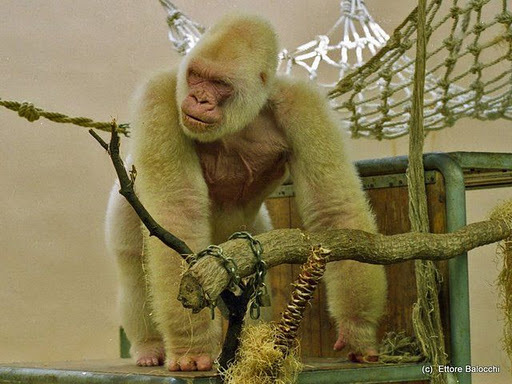 Originally named Nfumu Ngui in Fang language (“white gorilla”) by his captor, he was then nicknamed Floquet de Neu (Catalan for little snowflake) by his keeper Jordi Sabater Pi. 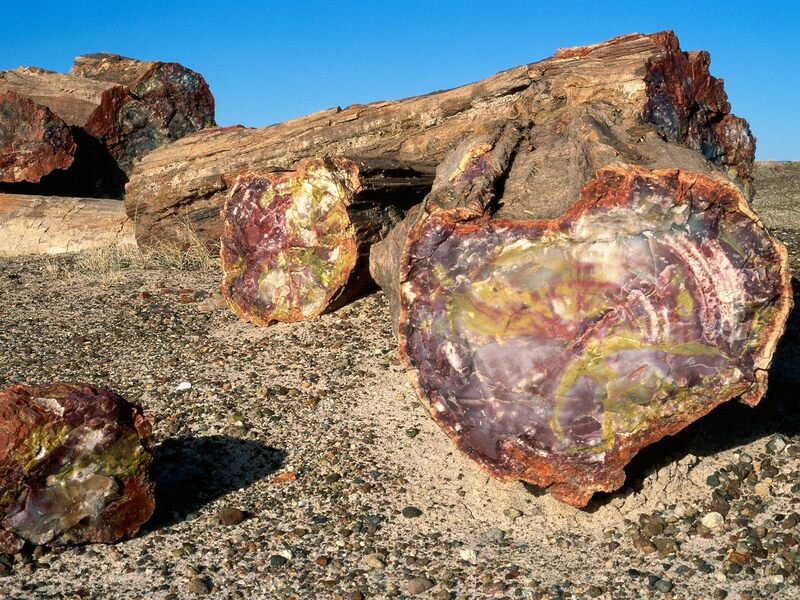 The official story is that an ape specialist, Jordi Sabater Pi, found the animal in 1966 in Ikunde, in the then Spanish colony of Spanish Guinea, modern-day Equatorial Guinea. The only albino gorilla known to man, he was captured outside Nko, in the Equatorial forest of Nko, near Rio Campo, in the Rio Muni region, on October 1, 1966, by Benito Mañé, an ethnic Fang farmer, who had killed the rest of his group (all charcoal black in color) in order to obtain this unusual albino specimen. During the massacre, his mother was shot by Mañé whilst she tore a banana stem apart in his banana plantation. The small creature was found clinging to his mother’s neck, his head buried deep in her black fur. Benito kept him at his own home for four days and then transported him to Bata, where he was purchased by Sabater Pi, who worked for the Barcelona Zoo’s Ikunde Center, in Spanish Guinea, and paid 10,500 pesetas for the gorilla. A National Geographic-funded study of gorillas in the region was underway at the time of Snowflake’s discovery. Snowflake was a Western Lowland Gorilla. He spent most of his life at the Barcelona Zoo in the Parc de la Ciutadella. He was known worldwide, mentioned in tourist guides and put on postcards, becoming the unofficial mascot for the city. At first, the Barcelona Zoo was not aware just how unique a specimen Snowflake was. They sent a message to Sabater Pi saying, “Please send more white gorillas.” The zoo later hoped to produce an entire family group of white gorillas through selective breeding. He was thought to be between 38 and 40 years old; the average lifespan of a gorilla in the wild is 25. Since 2001, he had suffered from an unusual form of skin cancer, almost certainly related to his albinism condition, known as oculocutaneous albinism type 1 or OCA1. In September 2003, it was publicly announced that he was dying. Thousands visited the zoo to say goodbye before he was euthanized in November 2003. 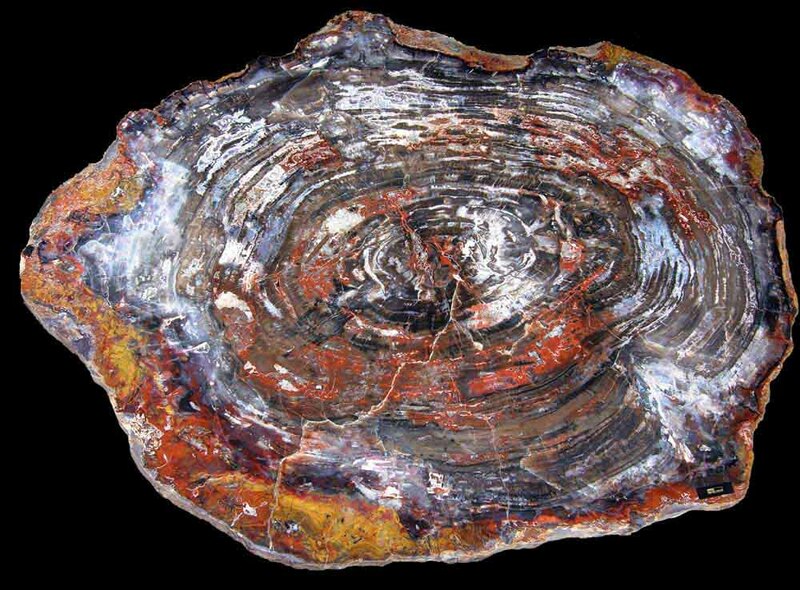 The asteroid 95962 Copito, discovered by Catalan astronomer J. Manteca, is named in his honour. 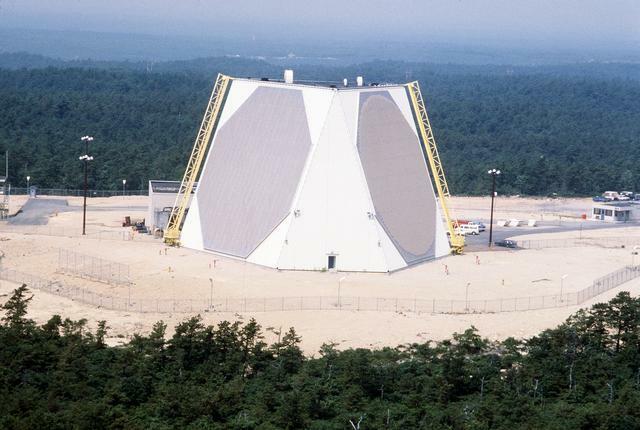 PAVE is an Air Force program name relating to electronic systems, while PAWS stands for Phased Array Warning System.PAVE has also been defined as an acronym for Precision Acquisition Vehicle Entry, but that is likely a backronym created to explain the program name. 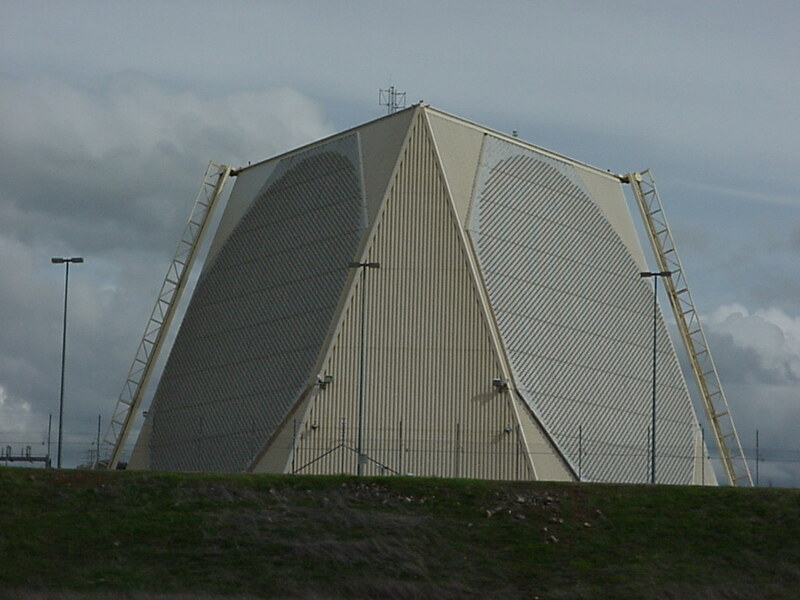 The radar, developed by Raytheon, is used primarily to detect and track sea-launched (SLBM) and intercontinental ballistic missiles (ICBMs). 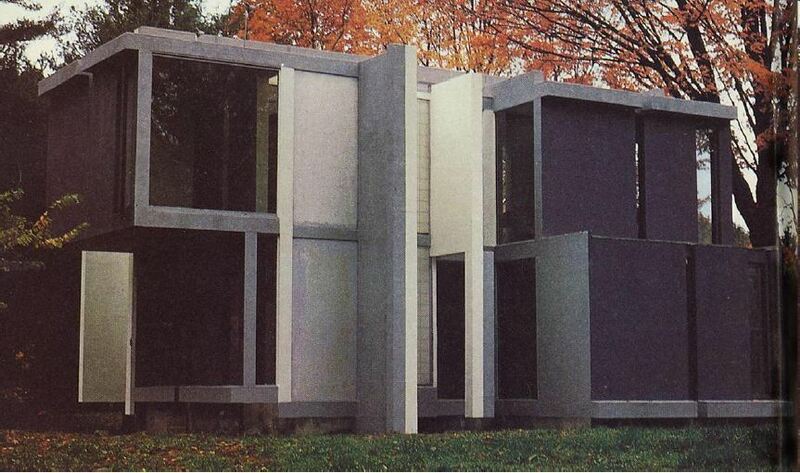 House VI, or the Frank Residence, is a significant building designed by Peter Eisenman, completed in 1975. His second built work, the getaway house, located on Great Hollow Road near Bird’s Eye Brook in Cornwall, Connecticut (across from Mohawk Mountain Ski Area) has become famous for both its revolutionary definition of a house as much as for the physical problems of design and difficulty of use. At the time of construction, the architect was known almost exclusively as a theorist and “paper architect,” promulgating a highlyformalist approach to architecture he calls “postfunctionalism.” Rather than form following function or an aesthetic design, the design emerged from a conceptual process, and remains pinned to that conceptual framework. Unfortunately, Eisenman’s limited construction experience meant that the entire building was poorly detailed. 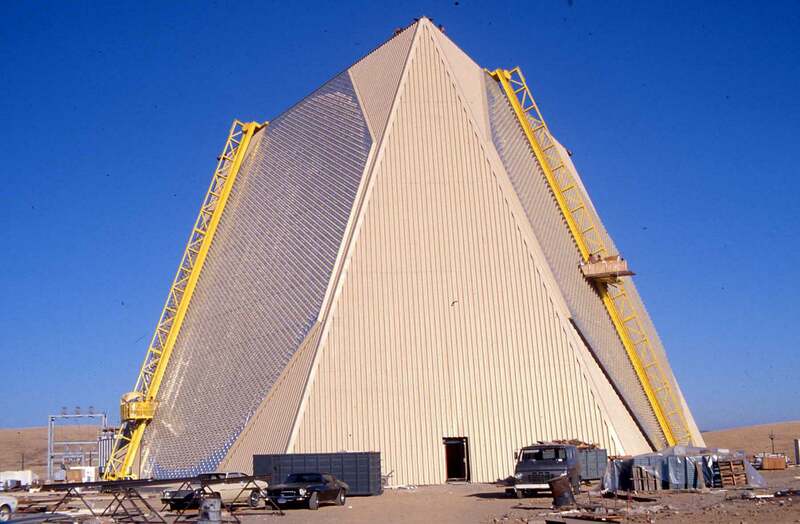 The tiny building took 3 years to build, went completely over budget, and finally had to be reconstructed in 1987, leaving only the basic structure original. 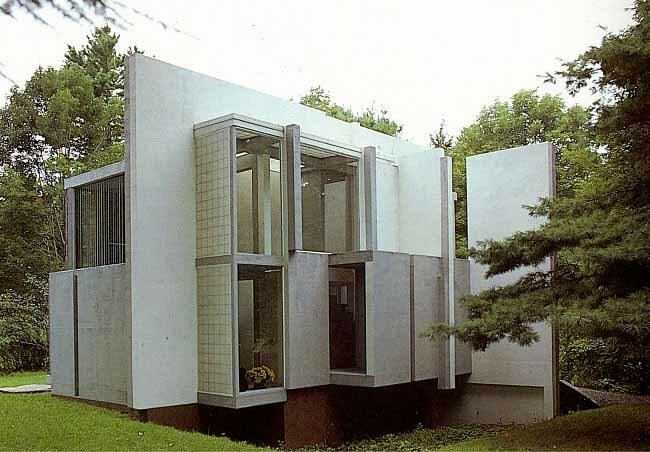 The Franks, in Peter Eisenman’s House VI: The Client’s Response, claim that they nonetheless love living in such a poetic structure, which they inhabit with their children. Also on the property is a barn for guests and supplies that do not fit in the kitchen. The building is meant to be a “record of design process,” where the structure that results is the methodical manipulation of a grid. To start, Eisenman created a form from the intersection of four planes, subsequently manipulating the structures again and again, until coherent spaces began to emerge. 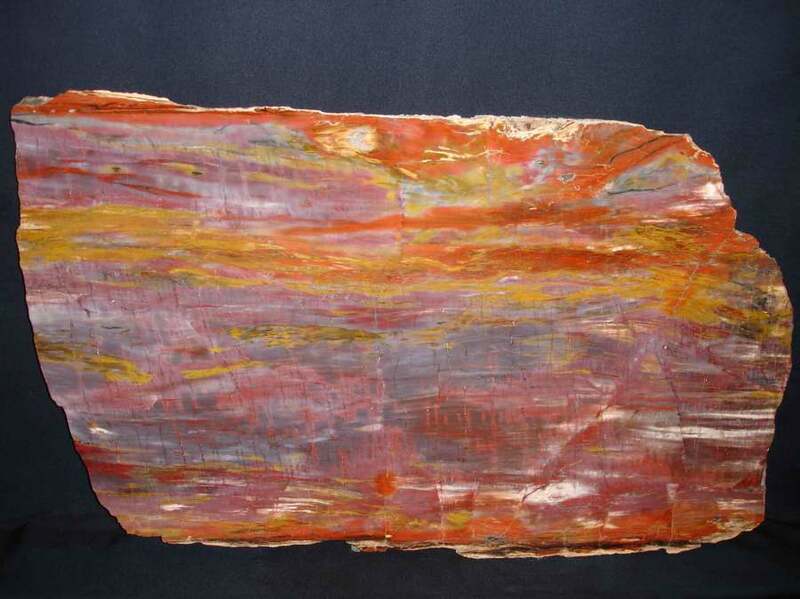 In this way, the fragmented slabs and columns lack a traditional purpose, or even a conventionalmodernist one. The envelope and structure of the building are just a manifestation of the changed elements of the original four slabs, with some limited modifications. 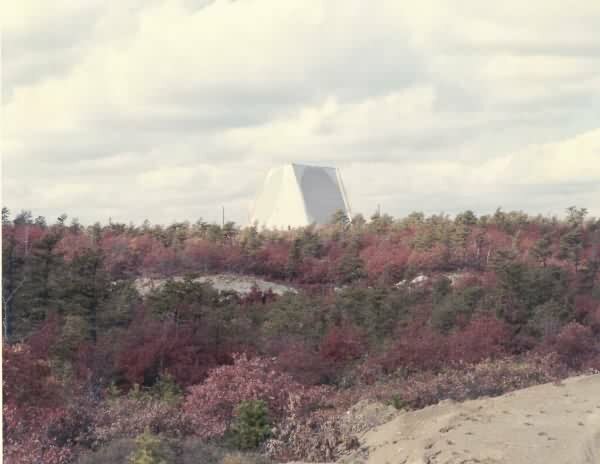 The purely conceptual design meant that the architecture is strictly plastic, bearing no relationship to construction techniques or purely ornamental form. Consequently, the use of the building was intentionally ignored – not fought against. Eisenman grudgingly permitted a handful of compromises, such as a bathroom, but the staircase lacks a handrail, there is a column abutting the kitchen table, and a glass strip originally divided the bedroom, preventing the installation of a double bed. 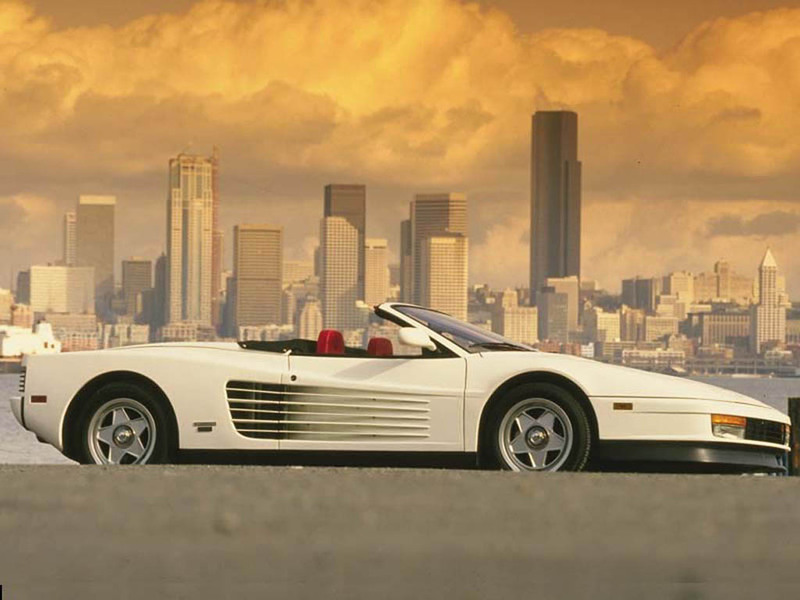 The Testarossa name, which means “red head” in Italian, comes from the red-painted cam covers on the flat-12 engine. The double entendre with a red-headed woman was intentional – Ferrari and Pininfarina regularly use descriptive terms related to a female’s body when describing the style of their automobiles. As Ferrari’s range-topper during the 1980s, the car made appearances in numerous video games, most notably the arcade games Out Run and also in the TV series Miami Vice, as Sonny Crockett’s undercover car from season three. The car has subsequently become synonymous with 80s “yuppies” and is an icon of 80s retro culture. 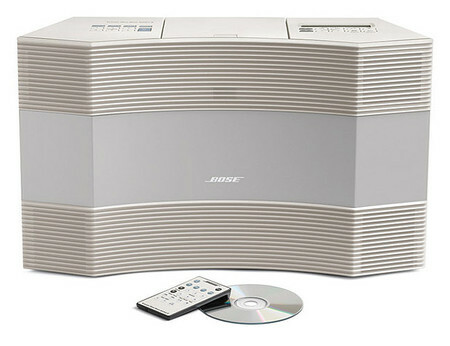 Bose Corporation‘s Wave Music Systems are table top radios that have been selling from its inception in 1984 to today. The wave radios are considered all-in-one systems with “A decade of research” that allowed for better sound in a smaller unit. The year 1993 saw the first Bose “Acoustic Wave System” developed for an automotive application. In 1993 Mazda unveiled the third generation of its RX-7 sports car, featuring an optional Bose designed sound system. This included a unique Bose “Acoustic Waveguide” rear subwoofer system. Instead of a traditional large subwoofer (typically eight inch or more diameter), this system makes use of two small subwoofers mounted in an enclosure with two long wave guide tubes extending to the passenger and driver’s sides of the car. 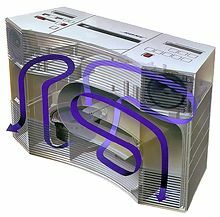 In 1984 the original Bose Wave system, called the Acoustic Wave Music System (AW-1), was Bose’s first-ever tabletop radio. It utilized two 2″ drivers (speakers), and a four inch bass driver which is the only speaker utilizing the Wave Guide , a cassette player, and an AM/FM radio into a mid-sized tabletop stereo system. 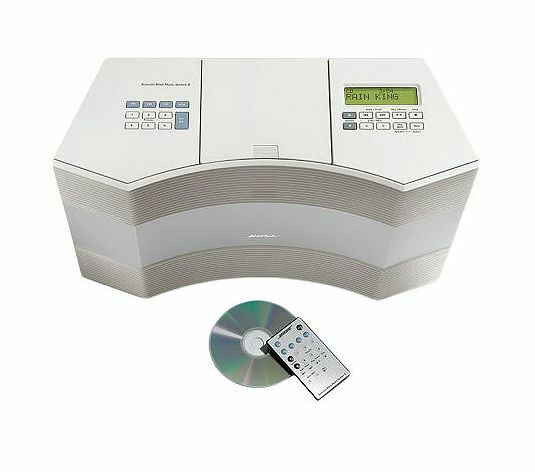 It was not until 1992 that Bose replaced the cassette player with a CD player, the CD2000, but Bose continued to sell a cassette player version, the CS2010, as an alternative to the CD version until the Acoustic Wave Music System v3 (CD3000) replaced both of them in 1996. Fällkniven, is a Swedish-based manufacturer of knives and knife-related gear and apparel. Fällkniven was founded in 1984 by company president Peter Hjortberger. The company started by importing knives and, in 1987, began designing their own knives. The Glock 18 is a selective fire variant of the Glock 17, developed at the request of the Austrian counter-terrorist unit EKO Cobra. This machine pistol-class firearm has a lever-type fire-control selector switch, installed on the serrated portion of the rear left side of the slide. With the selector lever in the bottom position, the pistol will shoot fully automatic, and with the selector lever in the top position, the pistol will fire semi-automatically. The firearm is typically used with an extended 33-round capacity magazine, although other magazines from the Glock 17 will function, with available capacities of 10, 17, or 19 rounds. Early Glock 18 models were ported to reduce muzzle rise during automatic fire. 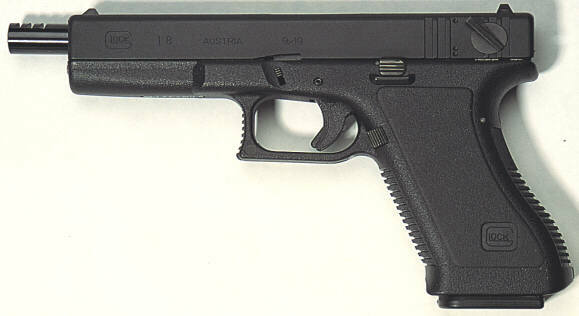 Another compensated variant was produced, known as the Glock 18C. It has a keyhole opening cut into the forward portion of the slide, similar to the opening on the Glock long-slide models, although the Glock 18 has a standard-length slide. The keyhole opening provides an area to allow the four, progressively larger (from back to front) compensator cuts machined into the barrel to vent the propellant gases upwards, affording more control over the rapid-firing machine pistol. The compensator cuts start about halfway back on the top of the barrel. The two rear cuts are narrower than the two front cuts. The slide is hollowed, or dished-out, in a rectangular pattern between the rear of the ejection port and the rear sight. The rate of fire in fully automatic mode is approximately 1,100–1,200 rounds per minute. Most of the other characteristics are equivalent to the Glock 17, although the slide, frame, and certain fire-control parts of the Glock 18 are not interchangeable with other Glock models. The M6 Scout is a multipurpose firearm, combining rifle and shotgun. It has been in and out of commercial production several times since the late 1970s (out of production again as of March 2008). The latest models were manufactured by Česká Zbrojovka Uhersky Brod and sold by Springfield Armory. Other variations of this firearm are the M6 Carbine and the M6 Scout Pistol. The M6 Scout was produced in two types, a standard model with Parkerized finish and a version made from rustproof stainless steel.The M6 design and model number come from the M6 Aircrew Survival Weapon, issued to U.S. Air Force aircrew from the late 1950s until the early 1970s. The commercial model is nearly identical to the USAF version, though there are a couple of minor cosmetic differences. There is a removable trigger guard. The greatest change is that the commercial model has a barrel length of 18.25 inches (46.4 cm) instead of the 14 inches (36 cm) barrel length of the USAF version. Athens Arms produced a 14″ barreled version that qualified as “Any Other Weapon” (AOW) under the NFAexemption for the Marble Game Getter: combination of rifled and smooth bore barrels between 12 and 18 inches. Unlike nearly all other firearms, there is no “furniture” on the M6 — no wooden or composite stock or forearm — the only parts which are not steel are the rubber buttplate and cheek rest. 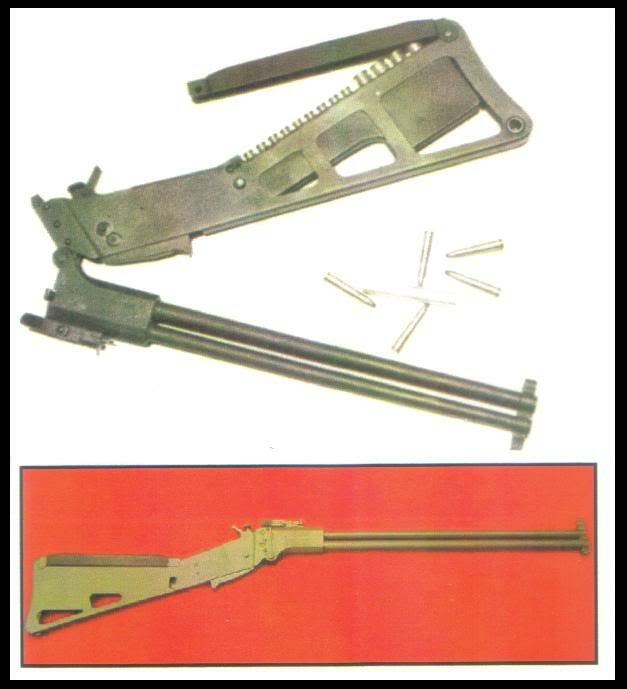 The M6 stock is stamped sheet steel, while the removable barrel assembly is forged steel. Aircrew who were issued the M6 were instructed on a way to make a field expedient forearm by wrapping the barrels with a length of shroud line from their parachute. The USAF M6 Survival Weapon used iron sights, while the M6 Scout commercial model includes provision for mounting a telescopic sight. The stock holds four .410 shells and 15 .22 LR cartridges. The stock of the version in .22 Hornet stores 9 rifle rounds and 4 shotgun shells. The M6 Scout is a superposed “over-under” design, with a rifle barrel mounted above a .410 shotgun barrel. 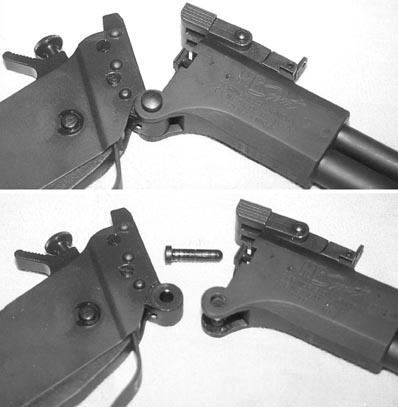 The barrel assembly is connected to the stock/action group by means of a removable hinge pin. 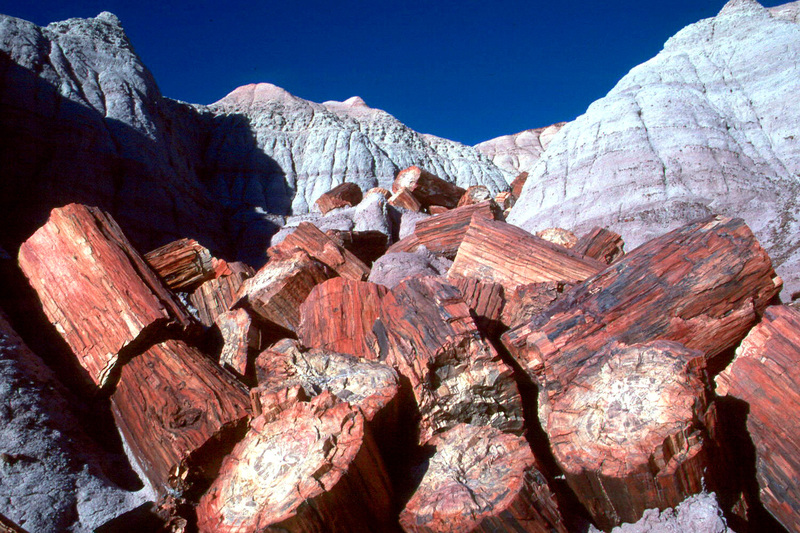 Whether folded or disassembled, the overall length for storage is approximately 18.5 inches. The commercial production M6 was made in .22 Long Riflein addition to the .22 Hornet used in the USAF M6. The advantage of the .22 Hornet / .410 shotgun combination is to enable the user to take any type of small or medium-sized game. .22 Hornet has been used to hunt animals up to the size of small deer (and can be used for defense), while shotshells are used for birds or snakes. One other unique feature of the M6 is the “squeeze-bar trigger.” Intended for use by aircrew who might be downed in any type of weather and terrain, the trigger, hammer and barrel latch are designed to be easily operated while wearing heavy gloves or even mittens. To this end, the USAF M6 was the only firearm issued to American armed forces which had no trigger guard. The amount of pressure needed to release the sear, combined with the practice of keeping the hammer uncocked unless preparing to fire, was considered sufficient to counter any risk of accidental discharge. The design also reflects the philosophy that downed aircrew are supposed to stay quiet, out of sight and be patient. This was considered an advantage over the bolt actionArmalite AR-5 during procurement tests. The AR-5 is relatively complex, less durable and, without the shotgun barrel, less versatile. 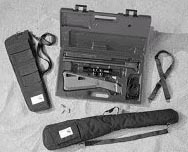 The Armalite had several advantages, however, including the ability to float, and the buttstock acts as a storage case for the parts of the disassembled rifle. For these reasons, the AR-5 was also accepted and designated the MA-1 Survival Rifle, and the AR-7, a commercial semiautomatic version in .22 Long Rifle, has been popular for decades. Aircrew who preferred the M6 noted that, with the AR-5, an excited user can go through a week’s worth of ammo in moments, while the user of the M6 is more likely to use proper shooting techniques due to the time necessary to reload after each shot. According to an often-repeated story, the body of the young woman was pulled out of the Seine River at the Quai du Louvre in Paris around the late 1880s. The body showed no signs of violence, and suicide was suspected. 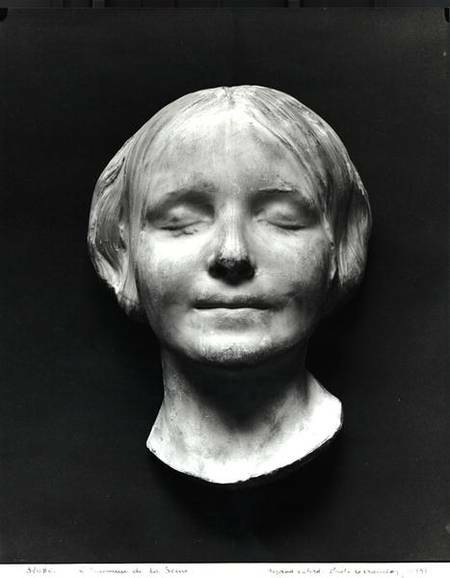 A pathologist at the Paris morgue was so taken by her beauty that he had a moulder make a plaster cast death mask of her face. According to other accounts, the mask was taken from the daughter of a mask manufacturer in Germany. The identity of the girl was never discovered. 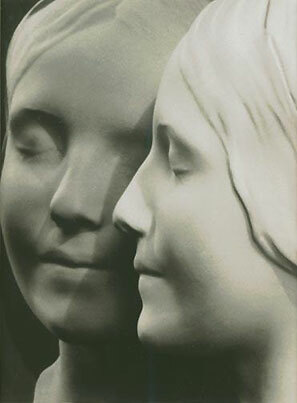 The moulder who took the cast of the face was believed to be based at the Lorenzi family model-making firm. Claire Forestier, a member of the Lorenzi family, believes that the model was not dead when the cast was taken. She works in the family modelling workshop, and says that a dead body from a river would not have such clear features. She estimated the age of the model at no more than 16, given the firmness of the skin. 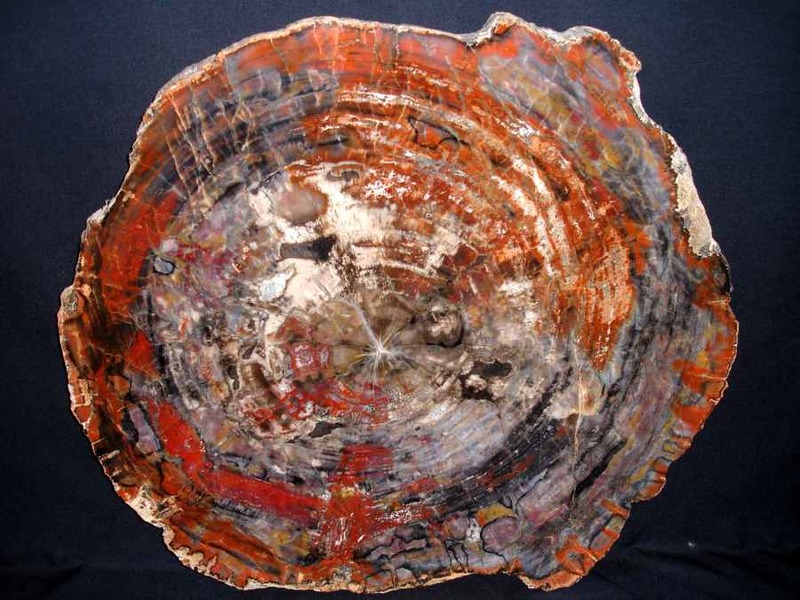 In the following years, numerous copies were produced. The copies quickly became a fashionable morbid fixture in Parisian Bohemian society. Albert Camus and others compared her enigmatic smile to that of the Mona Lisa, inviting numerous speculations as to what clues the eerily happy expression in her face could offer about her life, her death, and her place in society. The popularity of the figure is also of interest to the history of artistic media, relating to its widespread reproduction. The original cast had been photographed, and new casts were created back from the film negatives. These new casts displayed details that are usually lost in bodies taken from the water, but the apparent preservation of these details in the visage of the cast seemed to only reinforce its authenticity.